This species is accepted, and its native range is Europe to Siberia and Iran, Macaronesia to NW. Africa. Naturalizada y adventicia en Colombia; Alt. 2600 - 3100 m.; Andes. Viola arvensis subsp. megalantha Nauenb. Yousefi, N., Saeidi Mehrvarz, S. & Marcussen, T. (2012). Taxonomy of Viola sect. Melanium (Violaceae) in Iran Ot Sistematik Botanik Dergisi 19: 35-43. Scoppola, A. & Lattanzi, E. (2012). Viola section Melanium (Violaceae) in Italy. New data on morphology of Viola tricolor-group Webbia; Raccolta de Scritti Botanici 67: 47-64. Peschkova, G.A. (ed.) (2006). Flora of Siberia 10: 1-314. Scientific Publishers, Inc., Enfield, Plymouth. Broughton, D.A. & McAdam, J.H. (2002). 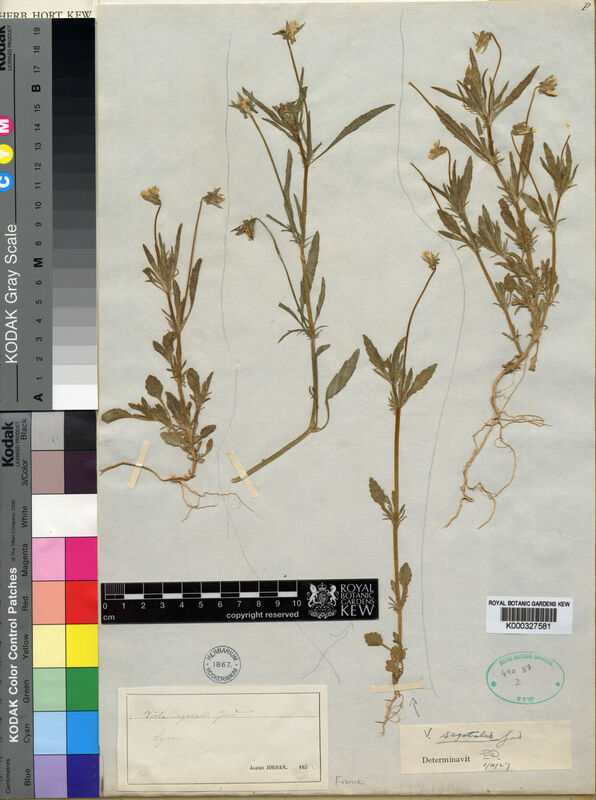 The non-native vascular flora of the Falkland islands Botanical Journal of Scotland 54: 153-190. Kharkevich, S.S. (ed.) (1987). Plantae Vasculares Orientalis Extremi Sovietici 2: 1-448. Nauka, Leningrad.